Welcome to Bellingham, WA. Twenty minutes south of us you’ll meet your friendly sea kayak guide at one of our favorite local paddling destinations. 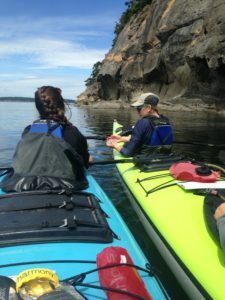 Our half-day adventure is an excellent introduction to sea kayaking in the San Juans, accessible from one of the most beautiful roads in Washington State. During our time together we will enjoy 2-3 hours of on-the-water paddling and exploration, beginning with a “hands-on” introduction to acquaint new paddlers with safety procedures and equipment. Gliding across Chuckanut Sandstone formations and keeping an eye out for wildlife, we will stop and stretch our legs on a Nature Conservancy protected Island in the bay or a beautiful beach along the way. We love sharing the history of our backyard, full of surprises and wonder – we can’t wait to share it with YOU. 10:00am: Arrive at Wildcat Cove, meet your guide, hand out safety equipment. Discuss kayak safety, paddling technique, and the day’s route. Highlights: Enjoy the views, explore the coastline, and learn about the plants, animals, and history of the Salish Sea. Frequent visitors include: Bald Eagles, Harbor Seals, Sea Stars, Sea Anemones and so much more! Enjoying a beach break, island visit or tide pooling! 1:00pm: Land back in Wildcat Cove in Larrabee State Park. Load boats and return safety gear. Includes: -Stable fiberglass tandem sea kayaks, kayak paddles, pfd’s, spray skirt, a light on water snack and other kayak related safety equipment. Young Naturalist of the Day – watch your kiddo’s take lead in the discovery of WILDLIFE. Leave the safety & planning to us while you kick back and have FUN with your family! After all, this should feel like vacation! Triple kayaks available by request! Recommended minimum age = 7 years, contact us today about getting your family on the water! Half-day paddles are great for families, wedding parties, team building, corporate events and more! * Please refer to our FAQ’S page for more information or shoot us an email! * Half-Day Trips NOT offered on Lummi Island.